which was found clutched in his hand when he died. One evening during my conversations with Mrs. Attila, she brought forth the Attila scrapbook. This book, about the size of a large bible, was beautifully bound in heavy leather, and had on the cover an imprint of two dumbells crossed over one another, and in large letters, “Attila’s Scrap Book.” Naturally I read and re-read this book, and it taught me much. In it I found newspaper clippings about the Professor from all over the civilized world! There were articles in French, German, Italian, Dutch, Spanish, Russian, English and other languages. 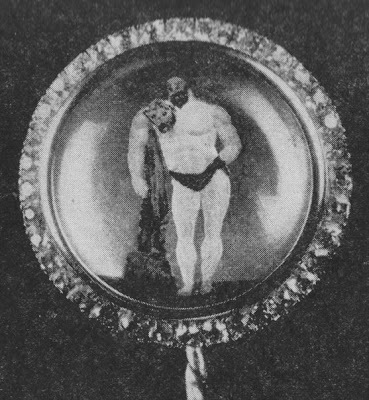 Old reproductions of photographs of Attila and Sandow graced many of the pages. In short, this book was really a goldmine of information about Professor Attila. At night I would often sit before a huge oil painting of Attila, painted in London in 1887, representing the pose he always took as the curtains parted and the stage lit up at the beginning of his act. As I gazed at the painting in the dimly lit room, a feeling of nostalgia would come over me. I visualized many of the interesting happenings that I had read about in scrapbook, and suddenly the painting would seem to come alive and Attila would be actually performing for me. It was as if I was being tendered a command performance to the accompaniment of Victrola music that I always played during these daydreams. I “saw” Attila going through his manual of arms with a huge ninety-pound steel bar, his famous Roman Column and Roman Chair feats, his juggling and his renowned “ball and cup” stunts. Again I would visualize Attila and Sandow performing, and would see them in the fashion of the day bow in acknowledgement to each other while one performed and the other stood on the side. Yes, it even seemed that Attila looked at me through his clear brown eyes and was pleased with his new successor. He was my spiritual mentor and my guide. What a rare combination of mental and physical inspiration I had in Attila and Sandow, the two greatest forces in molding my life! While I exercised I would look at Sandow’s pictures. If any problems came up regarding my training, I tried to imagine what Attila would say or do under the same conditions. It helped me immeasurably; it gave me courage and fortitude. I knew m decision was then right. I patterned myself after these two athletes as much as possible. As to the extent that I have succeeded, I will leave to others to say. This month (July, 1944) we are celebrating Attila’s hundredth anniversary. I think it would be very appropriate and fitting at this time to let my life story lapse for the time being and write about a man and athlete who was a guiding light and inspiration and was appropriately called “The Dean of Strong Men.” I will lift the curtain just a bit to reveal a few incidents about the man whose influence brought the strongman game and weightlifting to the heights of popularity it has enjoyed ever since. Professor Louis Attila was born July 2, 1844 in Karlsruhe, Baden, Germany and adopted the name of Attila from Attila the Hun, also called the Scourge of God. Attila the Hun was a conqueror, and Louis Attila was a conqueror as well; not of men’s lives and possessions, but of the indispositions that made men weak and apathetic. True, he aspired to and became a leader of men. As a great influence for good and not one whom others had feared or obeyed because of dire consequences that would follow defiance; he was revered and respected for the rightful counsel he would give. Instead of a demolisher he was an upbuilder. Incidentally, the name “Attila” often spelled “Atli” means “Iron” in the Hunnic language; the modern Germanic form for Attila is Eitel. I have read articles by press agents about Attila where it was stated that he adopted this name from his mother’s family name as it would be most suitable in his profession, and that his mother was a descendant of the ancient Attila, the King of the Huns. In his early teens Attila was on the stage doing a song and dance act. He was, however, interested in strength and strong-men even before this time and had taken some gymnastic lessons at the Turnvereins and also some private lessons from one Professor Ernst in Berlin. His decision to follow the strongman profession was at the time he first saw the great Felice Napoli (1821-1887) perform. Napoli was the greatest performer of strength feats from a classical point of view at the time, and engaged Attila to assist him. It was from Napoli that Attila learned the art of posing and doing pantomimes, for Napoli was, before venturing forth as a strongman, a pantomimist. When Attila was old enough, he enlisted in the Baden Sharpshooters and soon became known as the best athlete amongst the outfit, excelling in swimming, running and jumping. While doing guard duty on the grounds of the Duke of Baden, a baby carriage in which the Duke’s son was sleeping accidentally rolled into a private lake nearby. Attila saved the baby fro drowning and thus gained the friendship of the elder Duke and the man who was later to become Duke of Baden. After finishing his military service, Attila would accept numerous theatrical engagements. He would however open gymnasiums from time to time, and had them in Paris, Brussels, Berlin, The Hague, Vienna, Rotterdam, Leyden, London and other European cities. Attila was the originator of many of the exhibition feats of strength and barbell exercises which have become standard. He was the originator of the Bent Press, having taught this famous lift to Sandow and Strongfort. Others have learned the style from these two strongmen. He popularized the Roman Column, the Roman Chair and the Human Bridge. he was the originator of the hollow globe barbell, being also he first athlete to use these weights on the stage, made with brass and nickel plating. He originated his famous Five Pound Dumbell System which was later adopted by Sandow, Desbonnet, Strongfort, and was used as the basis of the military gymnastics by the British German, French, Turkish, Bavarian and Italian armies. He also introduced the plate loading barbell, universally used today. His fame was worldwide. he was an artistic performer, always preferring the artistic to a mere exhibition of strength. The highlight of his career was reached when he was summoned to appear at Queen Victoria’s Jubilee at Buckingham Palace, London, in 1887. Here, in the presence of practically the entire European Royalty, Attila gave his fabulous exhibition. One of the famous feats he displayed was going through the manual of arms with a ninety-pound steel bar about six feet in length instead of with the regular exhibition rifle. He would usually ask an officer to come on stage and command him through the drill. Besides a huge financial remuneration for his exhibition at the Jubilee, he was presented by the Prince of Wales with a jeweled scarf pin the size of a half-dollar bearing a miniature of Hercules, with leopard skin and sandals all highly colored. This was carved out of crystal and was surrounded by thirty-six diamonds. The Prince, later to become King Edward VII, engaged the Professor as private physical instructor, and a class of Royalty was formed. Among his royal pupils were the six children of King Christian of Denmark, Crown Prince Frederick, the future King Haakon of Norway, King George of Greece, The Duchess of Cumberland, the Queen Mother Alexandra of England, the Princess Dagmar of Denmark (later Empress of Russia) and mother of the late Czar Nicholas. His distinguished clientele brought him other pupils from among the elite. Among them were the Rajah of Haidarbad, the Rajah of Baroda in British East India, the Earl of Winchester, who presented Attila with a leopard skin and asked Attila to do the honor of making a leotard out of for his stage costume. The Count d’Oultremont, Grand Marshall of the Court of Belgium, Count Bielandt, General Aide do Camp of Her Majesty Queen Wilhelmina of Holland, Lord Lonsdale, Baron Edmond de Rothschild, and many other dignitaries, great financiers, noted men of state, dukes and duchesses, lords and ladies, princes and princesses, were also pupils of the famous Attila. Attila was not only a strongman, but also a man of large mental caliber and of wide education. Among other accomplishments, he was master of five languages and was an accomplished pianist. The famous Professor Desbonnet of Paris was his pupil also. His title “Professor” was not of his own creation but had been bestowed upon him by the beneficiaries of his scientific training. It was in 1886 that Sandow first came to him while Attila had a school in Brussels. 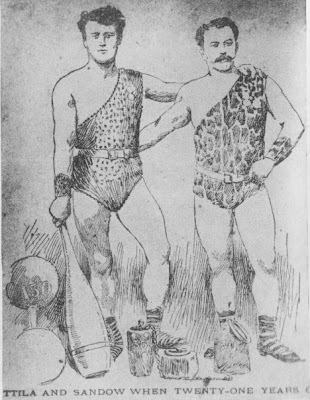 Sandow, whose right name was Frederick Muller, was trained in the niceties of stage presentations and posing by Attila, and he even gave him the name “Sandow.” The Attila-Sandow combine would make a small book in itself. In 1893 Attila came to America and opened his first school in New York City. Just as the prominent, the distinguished, the eminent and the great were pupils of his in Europe, he also had similar pupils in New York. He had here as pupils Supreme Court Judge Leaventritt, The Most Rev. Doctor Steele, Rector of Old Trinity, Richard K. Fox, owner and publisher of the Police Gazette, J. Pierpont Morgan, Jr., Julie Opp Faversham, Banker Seligman, Banker John C. Tomlinson, Alfred Vanderbilt, Florenz Ziegfeld, Oscar Hammerstein, Klaw, Erlanger, John Philip Sousa and hosts of other famous names too numerous to mention. His pupils among athletes, besides Sandow and Strongfort, of note were Louis Cyr, Horace Barre, Arthur Dandurand, Warren Lincoln Travis, G.W. Rolandow, H.W. Titus, Anthony Barker, Adolph Nordquest and many other athletes, some of whom became famous later. He had a way of inspiring pupils and had the knack of getting the finer qualities out of an athlete in the highest degree. Before James J. Corbett’s match with Charley Mitchell in 1894, Corbett enrolled for lessons with Attila. So well pleased was he that during his performance at the Bijou Theatre in Brooklyn, he invited Attila to witness his act from a box in the theatre. During this act, he invited the Professor on stage and presented him with a beautiful locket. On one side was a figure of the champion in fighting costume and attitude, and on the opposite side was a facsimile and the right arm of the pugilist surrounded by the paraphernalia employed in the strongman’s methods for muscular development. Within the locket was a miniature photograph of the fighter and a graceful tribute of esteem. During his professional career Attila was presented with over 200 medals. He had the honor of being a member in high standing in the lodge of which King Edward VII was Grand Master. He was also an Elk and a member of other orders and a Fellow Sloper, having received the degree simultaneously with King Edward VII. Can Gottfried, the bandleader of the Coldstream Guard, London, honored Attila by composing “The Attila Waltz” and also the “Attila March” which was published later in England. Attila used both of these compositions during his act. 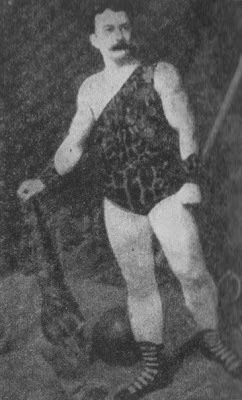 Professor Attila was the only athlete, professional or amateur, mentioned in the National Cyclopedia of American Biography. The compilers, determining to make mention of the greatest of the then athletic trainers, after several months of careful research, were brought to the recognition of Attila as the man who deserved that honor. In 1908 Attila opened another studio in Chicago at 2001 Michigan Avenue, and in 1912 he opened a studio in Detroit. He did not, however, stay there very long, for his personality was missed so much at his New York Institute that he had to return. When Attila was seventy-seven years of age, he still could do some exhibition feats of strength. He, on one occasion, lay on his back, brought a 220 lb. barbell over his head, and pressed it to arms’ length with a “shoulder-bridge.” I believe the last famous athlete to come to Attila for special training was Ernest Cadine, the French strongman, but Attila could not, at that late age, give Cadine the training that he needed; Cadine then went to Montreal and later returned to France. Professor Louis Attila died March 15th, 1924, at the age of eighty years. His name will live as long as barbells are used. Had it not been for Sandow, the physical culture teachers since his time would not have been the teachers of the present group of weightlifters and culturists, and you, reader, would probably not be reading this. Alan Calvert, who was the founder of “Strength” magazine, wrote some years ago that had it not been for Sandow, he would never have been inspired to make barbells and teach the methods of using them. It was through Attila’s famous pupils that the present generation of weightlifters and “Muscular Marvels” owe their success, for it was they who inspired us.